Industry specific wall maps are available in full colour showing a high level of detail, including: county borders, main towns and cities, ports and airports, as well as showing the HQs of the focus of each map (i.e. Police HQs on the Police Map). 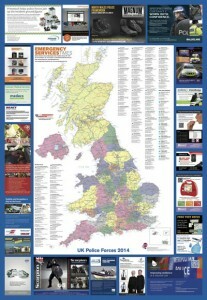 The maps are 1000mm x 690mm in size, printed on 200gsm paper and are ideal for wall hanging. Post and packing is free of charge and the maps are supplied folded for safe travel.